Within our beautifully landscaped 40-acre campus, residents and their loved ones have the opportunity to enjoy the great outdoors. Strolling along paved walkways you can meditate on a labyrinth, or relax near waterfalls, fishing ponds and gardens. Benches along the way offer you shaded places to rest, quiet areas to reflect, or private places to visit with family and friends. Wesley Heights (on the Wesley Village Campus) now has limited availability on select market rate independent living cottages. Monthly market rental rates apply. Cottage rentals include all utilities (except phone and cable),and a full calendar of activities and events. Meals, transportation, and other additional services and amenities are available on an a-la-carte basis. 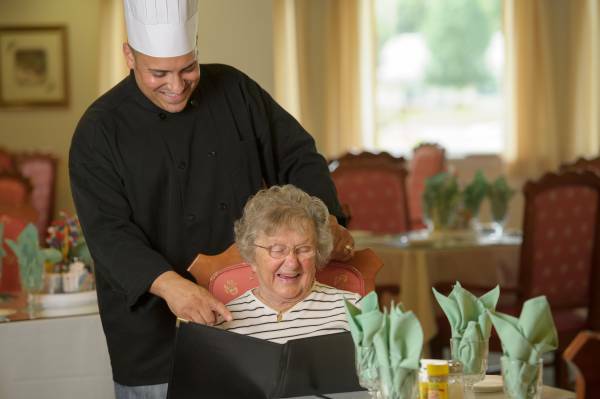 Located on our Wesley Village Campus and within our Wesley Heights Assisted Living Community, Lifestyle Transitions is a unique program which offers a supportive environment for individuals with changing care needs. Opened in January of 2015, the Lifestyle Transitions wing at Wesley Heights is the newest addition to the Wesley Village Campus, offering 29 different apartment styles for specialized assisted living and memory care. Wesley Heights Offers a choice of apartment sizes, all with full bath, ample closet space, and nearby laundry facilities. Monthly rentals include; all utilities expect for phone and cable TV, routine maintenance, parking, a 24 hour staff, and emergency call-for-aid system. Wesley Heights epitomizes our Mission; to provide services that support health, independence, and dignity through a relationship-centered philosophy which best sustains body, mind, and spirit. Each and every day our staff care from their hearts about our residents, not because it is their job, but because it is their calling in life. The wishes of those who prefer to live a private and quiet lifestyle are respected. For those who are looking to be active, adventurous and willing to experience new things, have we got exciting choices for you! Wesley Heights is a beautiful community that offers peace-of-mind and joyful living. Group exercise classes, Zumba, Drum Circles, Massage Therapy and our impressive Wellness Center nourish the body. Whether residents live in the central Wesley Heights building or in one of the independent cottages, they have many opportunities to interact. All residents have the opportunity to share three meals each day in the main Dining Room as well as participate in the many activities and events offered to meet their diverse interests and needs. Friendships are not just limited to fellow residents; we enjoy a variety of pet visits from the greater community. As most of us have enjoyed the companionship of animals in our lives, that passion continues at Wesley Heights! At Wesley Heights, the staff shares their special talents with our residents. Our Receptionist offers musical programs from karaoke to gospel to standard favorites; Pete our Director of Environmental Services offers classes on Zen Buddhism and Martial Arts, our Housekeeper Bernice helps residents make holiday decorations, and Lila our hairdresser not only plants and tends our herb and rose gardens with residents, and also offers ethnic cooking demonstrations while sharing customs from other countries. 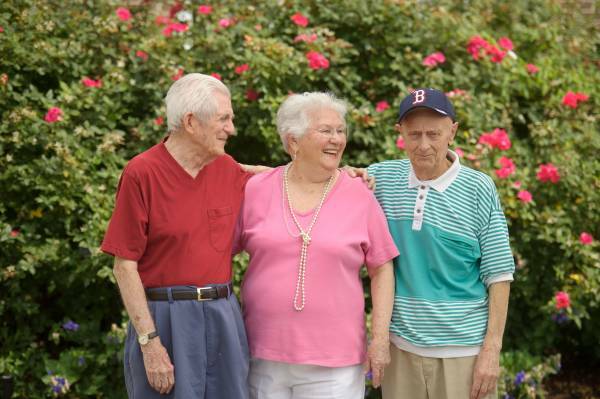 Each day residents have opportunities to meet new people, make friends, and connect with others, sharing their warm and generous spirit with others. Whether they are visiting in the library and discussing a good book or enjoying a cup of tea in the Sun Room together, friends are always gathering at Wesley Heights. Our knitting group offers a perfect opportunity for conversation and laughs, especially when our youngest volunteer, Jackson, is visiting with his grandmother to help serve coffee as the busy knitters shape their scarves, shawls, and hats. Our outdoor gardens provide a cozy spot to sit and enjoy blooming roses or fall leaves with a friend or neighbor. Whether you live in an independent cottage or an assisted living apartment, there are always plenty of chances for socializing, so be sure to enjoy them! Feeling lonely is never really any fun at all....but spending time with a friend at Wesley Heights can lift your spirits even on the gloomiest of days. For most of us, mealtimes are the most important part of the day. Wesley Heights residents are no exception! Three meals are served in the Dining Room each day, with meal plans available to all residents. Snacks are available for purchase in the General Store, open all throughout the day for those looking for a little extra treat. Residents can also enjoy cooking and baking activities and demonstrations with a Wesley Heights chef, which are always great fun, regardless of what is on the menu! Socials of all kinds provide opportunities to try new foods, enjoy favorite foods as a source of comfort, and gather with family and friends around the table. At UMH, we understand that no matter what your age, you still have dreams; Places you want to go, things you want to do, milestones to achieve. Big or small, the staff at our communities wants to help. The award-winning “Journey of Dreams” program was created on our Wesley Village Campus to offer opportunities for personal growth and fulfillment of individual dreams. Residents are encouraged to submit up to three wishes, goals or desires that they would like to come true. A committee meets to review the wishes and devise a plan to assist in the fulfillment of those wishes. View our most recent Dreams Here!